To be honest, I've never liked The Wizard of Oz because it scared me as a kid, but I do love a good twist on an old tale. The Wizard of Oz scared me as a kid too. I like some re-tellings though some bore me. Always looking to try new ones though and this one sounds really different in a good way. I usually prefer a loose re-telling. Oh gosh...yes, this one is way up near the top of my wishlist for this year! Sounds so amazing! I loved the wizard of oz! i'm excited about this one too. i keep hoping it'll pop up on edelweiss one of these days. YES! I am dying to read this one! THOSE FLYING MONKEYS!! Eep! And this one sounds AWESOME!! OMG Yes i cannot wait for this one!! This one looks so intriguing! I'm excited to read it :) great pick! I am worried that I am at the point where I want this one so bad that there is no way it can live up to my desire. 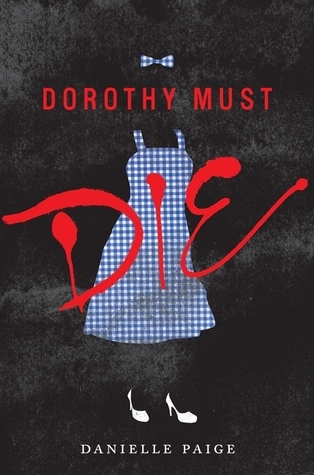 I love all things Oz and have Dorothy Must Die is on my wish list too. I'm so excited for its release! It sounds very interesting. Great Pick! Great pick! I'm super excited to read this one as well! I can't wait for this one too.. the cover is cool and everyone keeps talking about it on the blogs so it makes me even more eager! I added this book to my to-read list earlier this year. I'm a huge Wizard of Oz fan. I just heard about this one, too, and I think it sounds AWESOME. OOoh, I like the sound of this one. Wicked is a favorite of mine, and I'm assuming this one is from the POV of the witch too.